The SK-IB-R Connectivity Kit includes everything necessary to connect iButtons to your computer; including cable, adapter, and software. This makes selecting the hardware and software you need to get started quick and easy. The SK-IB -R Connectivity Kit can be used with all iButtons, including the Thermochron Family of iButtons. The DS1402D-DR8+ dual receptor interface cable and DS9490R# universal serial bus interface make the physical connection between the Thermochron and your computer. 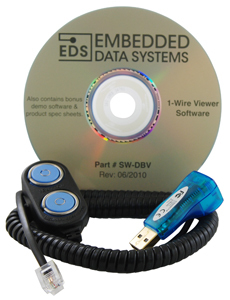 The 1-Wire Viewer software configures iButtons and enables you to read and analyze your logged data.